inov-8 is launching a revolutionary world-first in the sports footwear market following a unique collaboration with scientific experts. The British brand has teamed up with The University of Manchester to become the first-ever company to incorporate graphene into running and fitness shoes. Laboratory tests have shown that the rubber outsoles of these shoes, new to market in 2018, are stronger, more stretchy and more resistant to wear. Graphene is the thinnest material on earth and is 200 times stronger than steel. First isolated at The University of Manchester in 2004, it’s the world’s first two-dimensional material at just one-atom thick and has the potential to revolutionise many areas of technology. Michael Price, inov-8 product and marketing director, said: “Off-road runners and fitness athletes live at the sporting extreme and need the stickiest outsole grip possible to optimize their performance, be that when running on wet trails or working out in sweaty gyms. For too long, they have had to compromise this need for grip with the knowledge that such rubber wears down quickly. “Now, utilising the groundbreaking properties of graphene, there is no compromise. The new rubber we have developed with the National Graphene Institute at The University of Manchester allows us to smash the limits of grip. Graphene is produced from graphite, which was first mined in the Lake District fells of Northern England over 450 years ago. inov-8 too was forged in the same fells, albeit much more recently, in 2003. The brand now trades in 68 countries worldwide. Commenting on the collaboration and the patent-pending technology, inov-8 CEO Ian Bailey said: “Product innovation is the number-one priority for our brand. It’s the only way we can compete against the major sports brands. 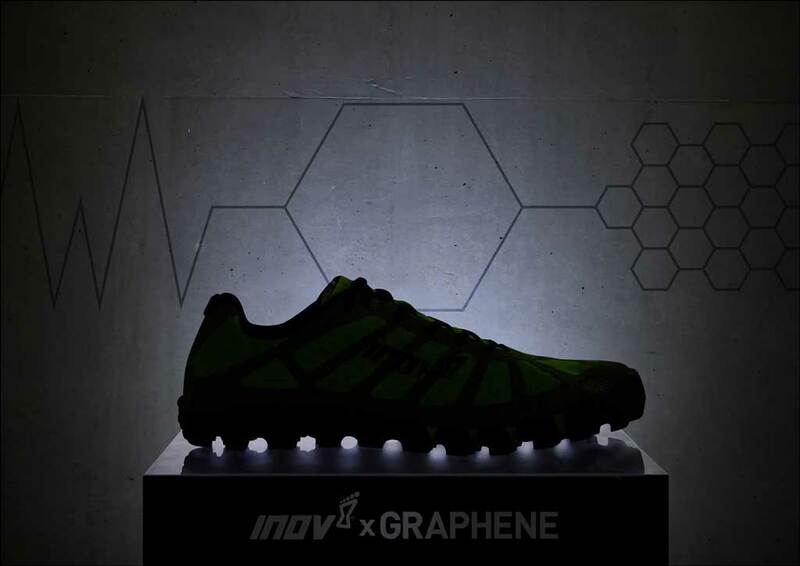 The pioneering collaboration between inov-8 and the The University of Manchester puts us – and Britain – at the forefront of a graphene sports footwear revolution. The scientists who first isolated graphene were awarded the Nobel Prize for physics in 2010. Building on their revolutionary work, the team at The University of Manchester has pioneered projects into graphene-enhanced sports cars, medical devices and aeroplanes. Now the University can add sports footwear to its list of world-firsts. Dr Aravind Vijayaraghavan, Reader in Nanomaterials at the University of Manchester, said: “Despite being the thinnest material in the world, graphene is also the strongest, and is 200 times stronger than steel. It’s also extraordinarily flexible, and can be bent, twisted, folded and stretched without incurring any damage. “The graphene-enhanced rubber can flex and grip to all surfaces more effectively, without wearing down quickly, providing reliably strong, long-lasting grip."